Airbus, the European aeronautics leader, causes ripples in the worldwide aeronautics industry any time they make a change. One of the changes they’ve made in their manufacturing process is using SpatialAnalyzer® (SA) for their portable metrology software needs. Change is a constant as manufacturing sectors see the value in improving their technology. Airbus, the European aeronautics leader, causes ripples in the worldwide aeronautics industry any time they make a change. One of the changes they’ve made in their manufacturing process is using SpatialAnalyzer® (SA). Change is a constant as manufacturing sectors see the value in improving their technology. Airbus is growing larger, especially in Asian markets, with major new airplanes like the A380 and A350. One of the reasons for the increase is the demand for efficiency in the passenger flight industry. In order to decrease the cost per person for flights, increasing the capacity of the plane means fewer trips and less fuel. SpatialAnalyzer is helping Airbus make sure the wings they build are aerodynamic and will deliver sufficient lift. As more changes happen in the industry, the ripple effect continues. The increased use of composite materials has brought new material suppliers into the fold of portable metrology by raising the bar for precision and compatibility with other components being shipped in from all parts of the world. Rick Cole of NRK shared some reflections on the changing market. 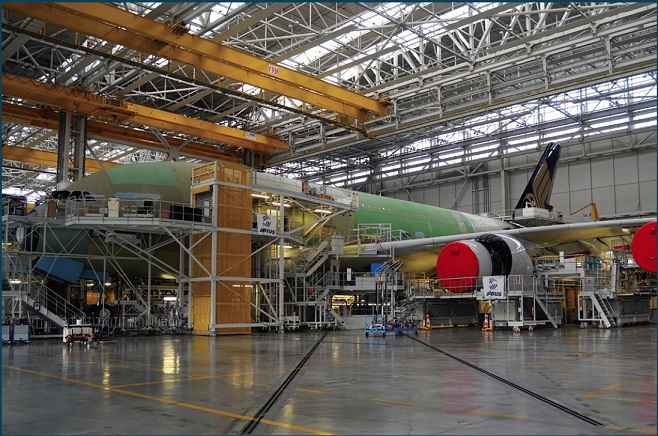 “The entire way Airbus manufactures has also changed – that includes processes, tolerances, and material behavior. Due to SA’s measurement plan, it’s particularly adapted to this automation, especially because of its ability to handle multiple portable instruments,” Cole said. One of the market adaptations that Airbus has made is working in a more competitive market. Gone are the days of technology sharing – things are more competitive and fierce. Changes in materials and assembly have revolutionized the industry – as well as other large transportation production. In the past, planes used to be hand-built, piece by piece. Now there is a drive for lower cost, raised quantity and repeatability. The use of robots and automation allow for duplication more easily in the manufacturing process of planes, trains, and automobiles. There are serious consequences if components are not aligned properly, especially if they are not aerodynamic enough to fly. This is a dangerous situation, particularly if it has a fuel payload that potentially could explode. The question is: How can you measure something to a hair’s breadth, if that something is the size of a locomotive? Well, with SpatialAnalyzer, you can, in any language, anywhere in the world.